Jungle Jack Hanna explores the corners of the globe as one of the most respected animal ambassadors. His enthusiasm and hands-on approach to wildlife conservation has won him widespread acclaim as a conservationist, television personality, author, and Director Emeritus of the Columbus Zoo and The Wilds. Recognized as America’s favorite zookeeper, Hanna has made countless television appearances since 1983. His infectious energy and popularity led to three nationally televised programs: Jack Hanna’s Animal Adventures, Jack Hanna’s Into the Wild, and Jack Hanna’s Wild Countdown. He has written a number of children’s books, and his memoir, Jungle Jack: My Wild Life, was published in 2008. It was great! 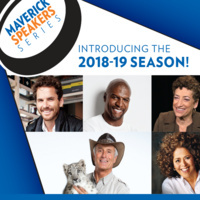 The Maverick Speakers Series has provided a variety of great speakers. Three generations of my family enjoyed this.